Following my last post I feel inspired to dig down further into the Flat Earth hole. This time I'm wondering; When exactly did people start thinking it was a ball? The general view is that people started adopting the globe model deep in antiquity. The ancient Greek Eratosthenes's measurement of the circumference of the Earth often being mentioned as a case in point. This was my view as well until very recently, I'm now wondering though if this was ever quite the case. It's generally reasoned that the world is so self-evidently spherical that anyone who's thought about the problem for more than 5 seconds will unerringly come to the conclusion that it's round. A flat earth world-view being the property of only the unthinking and the religiously inclined. And further more that throughout history, whenever people have really thought about the shape of the world, they've inevitably come to the correct conclusion. After all, how could they not? It's so obviously round. Only an idiot would believe it wasn't. However, I'm not so sure it was ever this cut and dried. I think maybe we're projecting our certainty on the subject back on to history. Forget NASA for a moment, forget Sputnik and other satellites. Forget high-powered telescopes. Without this direct evidence would the shape of the earth really be so obvious to everyone. My own ignorance has been exposed over the last few weeks. 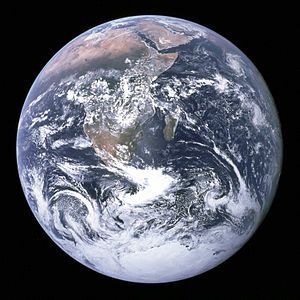 I have no idea how to prove the earth is a ball ..not without resorting to NASA images and the testimony of other people. Sure, I have a vague ladybird book sense of what the solar system looks like, and a vague idea that the phases of the moon are a consequence of the sun's reflected luminosity as it orbits around this earthly apple. But that's about it. Beyond that all I have is belief ..belief that it's round. How many other people out there are in a similar boat? It's also clear from reading about the history of the Flat Earth movement that right up until the beginning of the Space Age there were still many, many people holding on to the idea that the Earth was flat ..or at the very least sceptical of the idea that we're all spinning around the sun on a giant ball. Were they all idiots? Are we entitled to dismiss them so easily? Forget our modern accumulated evidence and go back to year zero for a moment. What can you see? What do you perceive? What do you see in the sky? Can you really tell it's a ball when you're not standing on the shoulders of giants? I'm getting back down to ground level for a moment. What do we see? Firstly, the earth seems flat. And as far as the eye can see it looks flat. Even high up on mountains you can't see a curve. Up feels like up and down feels like down. It intuitively seems flat. You'd be stupid to think otherwise. So what about the sky? Well the stars just look like points of light. No real indication that they're balls of fire. Just lights. And the planets - the wandering stars - look fairly similar. So that just leaves the sun and the moon. They're the biggest clues, but even so the sun looks just like a disc of bright light, and the moon, although it looks more planet-like (not that you'd know what a planet looked like), only shows one of its faces to us. We can't see it turning. So again, like the sun, it looks like a disc. Essentially the very vision of the universe we have today - in fact, the very concept of outer-space itself - is unavailable to our mind. It's not an option until we create it. Until we think it into existence. Growing up in a world of Star Trek and Science-Fiction we can't not have that image of outer-space in our head. We take it for granted, but it wasn't always the case. So what next? Maybe we start watching the sky. Noting the movements of the sun, the moon and the stars. We see their circular motion and watch them dip beneath, then reappear above the horizon. But even then would that automatically allow us to leap to a vision of a globular earth? If we see the sun go down below the horizon in one direction, then reappear again the next day back where it started from, would it necessarily be the case that it was going around a round earth. Maybe the sun would be going down into a distant ocean? - after all, the sea looks endless when we look out from the coast. Going down beneath the ocean, then beneath the earth, then reappearing out of a distant ocean on the other side. Or maybe it would be going down somewhere else - into some distant unknown. Either way we just don't know. No need for us to start imagining that we're standing on a ball just yet. No need just yet to throw out the evidence of our senses and consider that we may be hanging upside down on an endless curve. Now sure, sooner or later, some extra-clever mind may come along and suggest the counter-intuitive idea of a ball. Some ancient smart-arse, some Eratosthenes. But how certain would they be? And how many people would they be able to convince? How many others would believe or comprehend them? No satellite images to back up their case. No telescopes for those sitting on the fence curious enough to have a look. I think at best people would say that maybe it was round. In this light, belief in a flat earth seems a perfectly reasonable stance for anyone living in any previous era. Not at all the illogical stance that we view it as today with all our modern certainty. The question seems much more open-ended. The debate very much open and unfinished to them. I've mentioned in other posts how I'm slightly sceptical about the accepted view of history. I'm very much in sympathy with Fomenko and other time-line renegades. I think I may use the Flat Earth question as a way to look back at history afresh. Who knows, I may see things in a slightly new light. Alternatively I may only once again discover the extent of my own ignorance. Either way it'll be an education. Long live the ball.